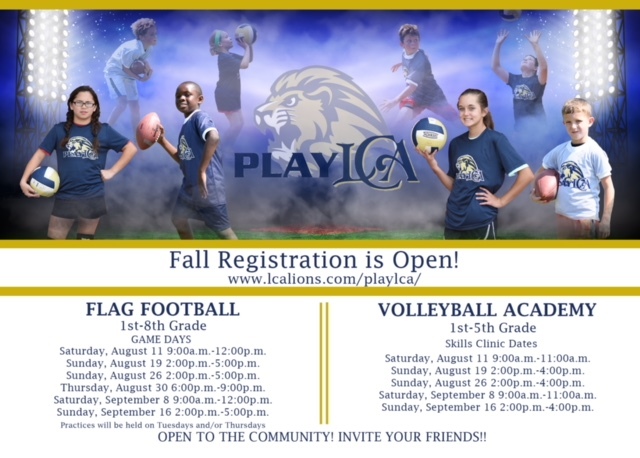 Fall programs include flag football (1st - 8th grade) and volleyball (1st - 5th grade). Participation is a great way for your child to learn new skills and engage in healthy competition ... but your kids will most likely be most excited about having fun with their friends! I know they won’t want to miss out, so sign up today. Flag Football registration CLOSES on July 27. Be sure to not miss this deadline as we will not be able to add your child after this date. Registration is available here. Volleyball registration will remain open through Launch on Friday, August 3. Registration is available here. Remember, programs are open to the community so invite your friends!